Overhead view of Suzuki GS550 head showing dual camshafts and drive sprockets. DOHC stands for Dual Overhead Cam valvetrain configurations place the engine camshaft within the cylinder heads, above the combustion chambers, and drive the valves or lifters in a more direct manner compared to overhead valves (OHV) and pushrods. 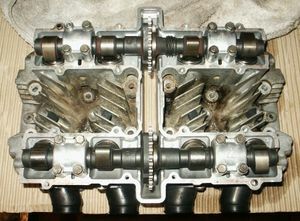 A double overhead camshaft valve train layout is characterized by two camshafts located within the cylinder head, one operating the inlet valves and one operating the exhaust valves. Some engines have more than one bank of cylinder heads (V8 and flat-four being two well-known examples) and these have more than two camshafts in total, but they remain DOHC. The term "twin cam" is imprecise, but will normally refer to a DOHC engine. Although most more than 2-valve per cylinder heads employ DOHC, some manufacturers still managed to use a SOHC in 4-valve layouts. Honda for instance with the later half of the D16 family, this is usually done to reduce overall costs. Also not all DOHC engines are multivalve engines—DOHC was common in two valve per cylinder heads for decades before multivalve heads appeared. Today, however, DOHC is synonymous with multi-valve heads since almost all DOHC engines have between three and five valves per cylinder. This page was last edited on 28 November 2010, at 16:42.